This has been a very busy summer in Wellington, in terms of events we've attended. On 10th February we had the X-Air games in the morning and the Petone Fiesta in the evening. On 17th February, Petone Fair with the parallel Gypsey Fair carrying on till 18th. 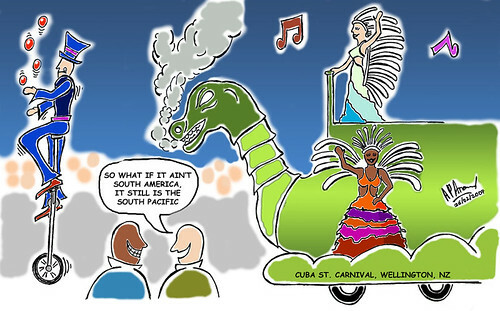 I may write about these later, but last weekend, it was the Cuba Street Carnival in central wellington. A very large crowd including suburbians, converged in central Wellington. There was plenty of fun to go around. With professional performers displaying their skills at various points along the streets. Food vendors sold snacks, roaster nuts, corn, even spanish paella. 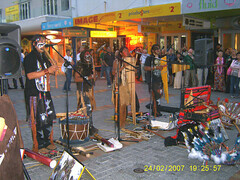 Our favourite among the performers were the Pan Pipes group. They seemed to be native South Americans and calling their group, 'The Cherokee spirit' or 'Los Incas' depends where you check. They performed amazing, soul-stirring music on pan pipes of every shape. I never realised that pan pipe instruments were capable of such a range. It sounds so much better live. Among the other street performers, there was also an acrobatic hulahoop group, the regular juggler, a Charlie Chaplin impersonator (the one who charged our camera), a juggling unicyclist and many others. There were several stages on various points with music bands programs. The adventurous also took their chances with the thrill rides. Then at 9:15pm, we had the carnival parade. The pictures and video's below will describe it all. All the photos can also be viewed at here. All the videos can be viewed at here. Thanks, look forward to your picture contributions. And believe it or not, the size of this page blog post page comes to : 221 kb (290 kb uncompressed). Cricket Fever - the 2007 World Cup is here!